Why one-way (or no-way) audio problem? We are often asked "why I cannot hear peer side?" or "why we cannot hear each other?". In most scenarios, the root reason is firewall filtering audio stream or NAT (network address translation) blocking it. We can always find that some SIP devices, including SIP phones, SIP clients and VoIP gateways, are deployed behind a NAT and configured with private IP address. Please check your router whether it can support SIP-ALG (Application Level Gateway) function. If it has such function, please disable it since most routers are full of bugs in their SIP-ALG. Once you disable it, please remember to restart your router. Please configure your router to forward following default UDP ports to the server or PC where your miniSIPServer is installed. If you are deploying SIP over TCP or TLS, you need forward TCP ports 5060 and 5061 too. If there is a firewall deployed in your VoIP network, for example Windows firewall, please try to shutdown it and make some test. If problem is resolved, that means you need ask administrator to configure firewall to enable miniSIPServer to be visited from public networks or private networks. If your SIP phones/devices are deployed in a private network, mostly you need configure STUN (Simple Traversal of UDP through NATs) server to help your SIP devices to route packages, such as audio packages. Most SIP devices can support STUN protocol. Below figure is STUN configuration in X-lite. By default, we configure 'stun.counterpath.net' as STUN server. If your MSS is deployed with public address, you can use it as your STUN server because it is embeded in MSS. Of course, you can also use our simple STUN server "stun.minisipserver.com". 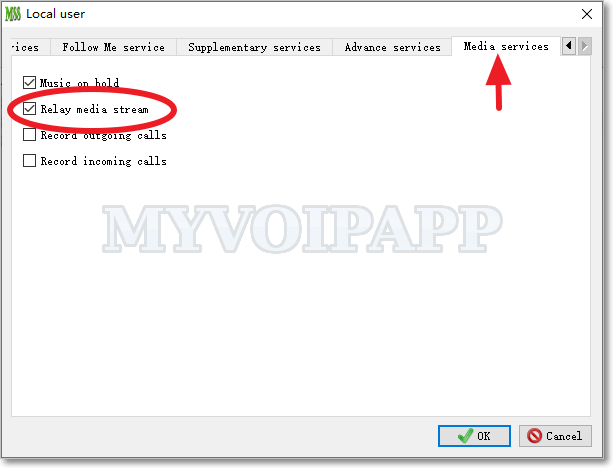 We need mention that all media streams will be sent MSS if you have configured such "relay media stream" item for local users. It will make heavy work-load to your server. And MSS cannot support relay video streams. In some area, local ISPs could block or change SIP signals which can also cause one-way audio problem. To avoid that, you can try to change standard SIP port or use SIP over TCP. Please refer to following documents for more details. How to resolve one-way audio problem?